Fairchild Air Force Base is located 12 miles west of the city of Spokane, Washington adjacent to US Highway 2 and 3 miles north of Interstate 90. The base is at an elevation of 2,463 feet above sea level and covers approximately 4,300 acres of high plains characteristic of Eastern Washington. Fairchild originated as the Spokane Army Air Depot in 1942 and was turned over to the United States Air Force (Strategic Air Command) in 1947. The base is currently shared with the Washington Air National Guard and several tenant organizations. Several facilities administered by the base are located in the surrounding area off the main base. 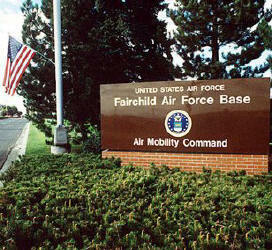 Fairchild AFB has been an important part of the Inland Empire since 1942. Construction crews poured the foundations for the first buildings of the Spokane Army Air Depot on March 2, 1942. Two cities in western Washington, Seattle and Everett, also sought to have the base built in their communities. The competition was keen, but Spokane won out in the end for several reasons. The War Department felt that Spokane offered better weather conditions than the western competitors, as well as something they could not offer: 300 miles and a mountain range as a natural barrier to possible Japanese attack. As an added incentive to the War Department, many Spokane businesses and public-minded citizens donated money to purchase the land for the base. At a cost of more than $125,000, these people bought 1,400 acres and presented the title to the War Department in January 1942. That year the government designated $14 million to purchase more land and begin construction on a new Spokane Army Air Depot. From 1943 until 1946, the base served as a repair depot for damaged aircraft returning from the Pacific Theater. In 1947, the base was transferred to the Strategic Air Command and assigned to 15th Air Force. The same year, the 92nd and 98th. Bomb Groups arrived. Both units flew the most advanced bomber of their day, the B-29. Just a year later, the base received the second of its three official names: Spokane Air Force Base. With the outbreak of hostilities in Korea, both groups deployed to Japan and Okinawa. After only a few months, General Douglas MacArthur released the 92nd to return to the states while the 98th remained in the Far East. The 98th was reassigned to Nebraska after the conflict. Upon its return to Fairchild, the 92nd was redesignated the 92nd Bombardment Wing (Heavy). The base took its current name in November 1950, in memory of the late Air Force Vice Chief of Staff General Muir S. Fairchild, a native of Bellingham, Wash. The general entered service as a sergeant with the Washington National Guard in June 1916 and died while on duty in the Pentagon in March 1950. The formal dedication ceremony was held on July 20, 1951 to coincide with the arrival of the wing's first B-36. About this time, the 111th Reconnaissance Wing (Air National Guard) was activated at Fairchild. Later, this unit was redesignated the 99th Bombardment Wing and transferred to Westover AFB, Mass. In October 1953, the Air Depot facility was deactivated. By 1956, the wing had begun a conversion that brought the B-52 Stratofortress and later, the KC-135 Stratotanker to Fairchild. In 1961, the 92nd became the first aerospace wing in the nation with the acquisition of the Atlas intercontinental ballistic missile. With the new role and the addition of missiles, the 92nd Bomb Wing was redesignated the 92nd Strategic Aerospace Wing. However, the designation remained longer than the missiles, as the Atlas missiles were removed in 1965. On March 1, 1966, the 3636th Combat Crew Training Group was activated at Fairchild. In 1971, it became a wing and assumed control over all Air Force survival schools. On September 1, 1991, under Air Force reorganization the 92nd Bombardment Wing (Heavy) was redesignated the 92nd Wing, emphasizing a dual bombing and refueling role. On March 1, 1992 the Fairchild Air Force Base and the Inland Empire community celebrated a golden anniversary. Fifty years as partners in the Northwest. In June 1992 the wing became part of the newly formed Air Combat Command and was redesignated the 92nd Bomb Wing. As Strategic Air Command (SAC) finished up 46 years of service to the nation, Fairchild bomber and tanker crews took top honors at Proud Shield '92. This was SAC's final Bombing/Navigation Competition. The wing won the Fairchild Trophy for best bomber/tanker team as well as the Saunders Trophy for the tanker unit attaining the most points on all competition missions. December 7, 1993 marked the beginning of perhaps the largest change and transition in the history of Fairchild and the 92nd Bomb Wing when the first B-52 left Fairchild to be turned over to another unit. The 92nd Bomb Wing's B-52s had been assigned to ACC, while the KC-135s were assigned to AMC and designated the 453rd Operations Group. During the spring of 1994, B-52s were transferred to other units and flown to other bases with the last bomber leaving May 25, 1994. The bomber mission of the 92nd had ended after 52 years, giving over to the new refueling mission on July 1, 1994. On July 1, 1994, the 92nd Bomb Wing was redesignated the 92nd Air Refueling Wing, and Fairchild AFB was transferred from Air Combat Command (ACC) to Air Mobility Command (AMC), in a ceremony marking the creation of the largest air refueling wing in the Air Force. Dubbed as the new �tanker hub of the Northwest,� the wing is capable of maintaining an air bridge across the nation and the world in support of US and allied forces. Fairchild currently has more than 60 active duty and Air National Guard KC-135 aircraft assigned. These aircraft and the dedicated members of Team Fairchild continue to actively support missions in Southwest Asia and throughout the world.